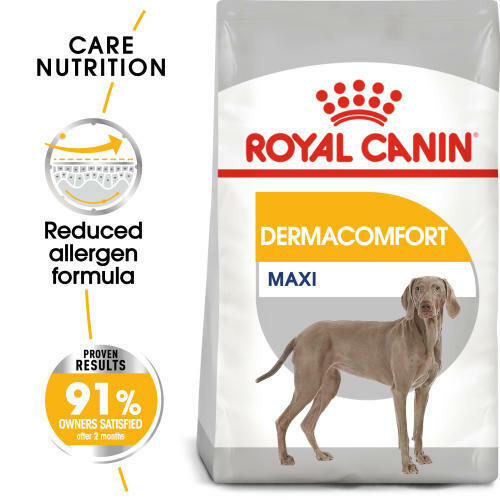 ROYAL CANIN Maxi Dermacomfort Adult Dry Dog Food is for large dogs from 26 to 44kg prone to skin irritation and itching. Reduced allergen formula - A dog’s overall wellbeing can be reflected in their skin & coat condition and diet plays an important role in maintaining their health. The MAXI DERMACOMFORT specific formula with selected protein sources of very high quality is particularly suited to dogs prone to skin irritation and itching. After 1 month, 87%* of dog owners perceived a reduction in scratching. *ROYAL CANIN internal study, 2009 - Study carried out with 82 dogs with a sensitive skin. Healthy skin cocktail - A unique combination of nutrients including an exclusive complex to help support the skin’s barrier role, combined with Omega 6 fatty acids (including gamma-linolenic acid) and Omega 3 fatty acids (including EPA and DHA) known for their beneficial effects on skin.A unique combination of nutrients including an exclusive complex to help support the skin’s barrier role, combined with Omega 6 fatty acids (including gamma-linolenic acid) and Omega 3 fatty acids (including EPA and DHA) known for their beneficial effects on skin. High palatability - Satisfies the appetite of large breed dogs thanks to carefully selected flavourings. Additives: Vitamin A: 29000 IU, Vitamin D3: 800 IU, E1 (Iron): 43 mg, E2 (Iodine): 4.3 mg, E4 (Copper): 13 mg, E5 (Manganese): 56 mg, E6 (Zinc): 168 mg, E8 (Selenium): 0.09 mg - Technological additives: Clinoptilolite of sedimentary origin: 5 g - Preservatives - Antioxidants. *L.I.P. : protein selected for its very high assimilation. Composition: Rice, wheat gluten*, wheat, animal fats, maize gluten, maize, husked oats, minerals, hydrolysed poultry liver, soya oil, beet pulp, fish oil (source of EPA and DHA), flax seeds (source of omega 3), fructo-oligo-saccharides, borage oil (source of gamma-linolenic acid), marigold extract (source of lutein). Crude ash: 5.8%. Crude fibre: 1.5%. Crude oil fats: 17%. Moisture: 0%. Protein: 25%.